COAHOMA - The Coahoma Bulldog varsity football team will be decked out in gold uniforms when they hit the field in Stanton Friday night against the Buffaloes as part of their efforts to raise funding for childhood cancer research facilities. 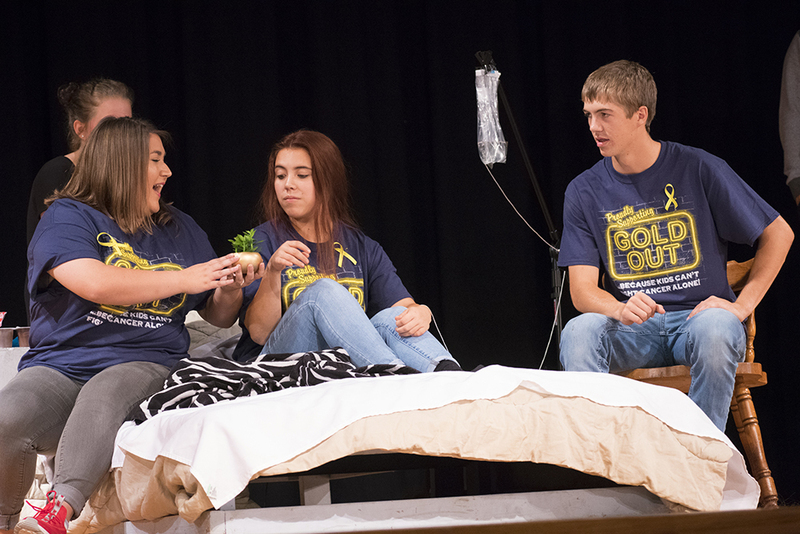 The new uniforms were debuted at a community assembly held Monday afternoon by the Coahoma High School theater department to spread the word about Gold Out, a fundraiser for childhood cancer research. Joslin is referring to Jeff Miller, the head football coach of the 2017 3A Division I Texas football champions the Rockdale High School Tigers, and a long time friend of Joslin and his wife, Kristen. In fact, Miller hired Joslin for his first coaching position in Jacksboro 16 years ago. Miller’s son Gunner was diagnosed with an aggressive form of bone cancer, Ewing’s Sarcoma, when he was a freshman. The news meant an end to his high school football playing days but not an end to his football career. Instead of leading his team on the field as the quarterback, Gunner served as a student coach for the Tigers’ special teams. He was on the sidelines when the Tigers won the state football championship. In fact, it was Gunner who snapped the final play of the game at his teammates’ request. Gunner’s mother, Angel, along with Kelly Pickel, who had a child struck with cancer, started Gold Out about four years ago after learning childhood cancer research doesn’t receive much fundraising dollars. In the past four years, Gold Out has raised more than $200,000 from various participating schools in Central, East, and South Texas. The organization hopes to raise $100,000 this year alone. Now the Joslins want to bring that movement West. During the assembly, the theater department put on an endearing play called “Red Rover” about a young girl fighting cancer. The production was researched, picked, and produced completely by the theater students, said Kristen Joslin, theater advisor. Gold Out shirts are being sold for $10 a piece to the end of this week and during the football game at Stanton Friday. Already, the theater department has had to reorder shirts to meet a growing demand. For each shirt sold, $7 will be donated to a childhood cancer research facility while $3 will go to covering the cost of the shirt. On Friday, the theater department will host a special pre-game event to honor survivors of childhood cancer. The Bulldogs will face off against the Buffaloes at 7:30 p.m. Friday in Stanton. See more photos of the assembly on the Coahoma Indepenedent School District Facebook site.